Justice Department and FBI prosecutors have recommended felony charges against former CIA director David Petraeus for leaking classified information to his mistress for a biography she was writing about him. It is now up to Attorney General Eric Holder to decide whether Petraeus should be charged and prosecuted for committing a crime, such as violating the Espionage Act. Thus far, while President Barack Obama has been president, at least nine individuals have been charged under the World War I-era law for leaking classified information. The record number is more than all previous presidents combined. Were it not for Petraeus’ past history as a decorated four-star military general who has held such positions as commander of United States Central Command and commanding US and International Assistance Security Forces (ISAF) in Afghanistan, he may have already begun to experience what it is like to be a victim of President Obama’s war against leaks. Perhaps, ironically, the news of charges being recommended against Petraeus came from leaks from anonymous “officials.” “The officials who said that charges had been recommended were briefed on the investigation but asked for anonymity because they were not authorized to discuss it,” the Times indicated. The update on the status of the investigation against Petraeus appears to have been provided to reporters by “officials,” who are frustrated Holder has not made a decision yet. Petraeus has rejected a plea deal. He may have made a calculation that the last thing the Justice Department wants to do is put someone who the Times describes as “the pre-eminent military officer of his generation” on trial. President Obama declared at a press conference in November 2012, that there had been no indication classified information had been leaked as a result of the affair. However, Reuters reported that “law enforcement and national security officials” had found a high enough quantity of classified information on Broadwell’s computer to “warrant a continuing investigation.” FBI “officials” predicted “criminal charges” were unlikely. There are two other cases involving high-profile individuals accused of unauthorized disclosures or improper use of classified information. James E. “Hoss” Cartwright, a retired US Marine Corps four-star general who served as the Vice Chairman of the Joint Chiefs of Staff, is accused of leaking information on the Stuxnet cyber attack on Iran’s nuclear infrastructure. Investigators have claimed classified information was found in veteran State Department diplomat Robin Raphel’s home. 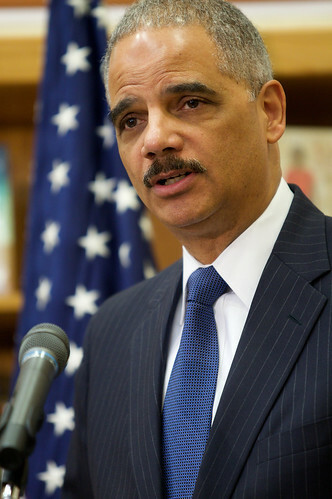 How all three of these individuals are handled will show whether the Justice Department leadership, particularly Holder, can equally apply the law they have so zealously wielded against low-level employees, many who have developed reputations as whistleblowers. It will show whether prosecutors have the will to use the draconian Espionage Act against high-profile individuals, potentially in cases like Petraeus’ where there is significant evidence of misconduct or wrongdoing. Does the Justice Department have the temerity to go after Petraeus like they went after CIA whistleblower John Kiriakou, who pled guilty to improperly revealing the name of an undercover officer in violation of the Intelligence Identities Act? If Petraeus put any undercover officers at risk while helping his lover piece together a fawning portrait of him, will prosecutors see to it that he goes to jail for 30 months? Or will this case become another example of how the government selectively prosecutes leaks? It seems distinctly possible that what happens to Petraeus will be similar to what happened with former Pentagon chief Leon Panetta and other senior officials, who a report found responsible for a “hemorrhage of leaks” to Zero Dark Thirty filmmakers on the raid that killed Osama bin Laden. Whistleblowers informed Republican Senator Chuck Grassley that a report on the investigation was edited to reflect the unauthorized disclosures had not come from senior officials. Acting and Deputy Inspector General Lynne Halbrooks suppressed the report to protect Panetta. And, when an uncensored version of the report was leaked to the Project on Government Oversight (POGO), Halbrooks launched a hunt for the person responsible and sought to hold a respected whistleblower advocate in government, Dan Meyer, responsible by taking action that could have destroyed Meyer’s career. Panetta leaked the name of an operative along with other classified information during a speech at CIA headquarters in which Zero Dark Thirty screenwriter Mark Boal was present. It does not matter that Panetta thought everyone there to hear him speak had proper security clearances. The way the Justice Department has prosecuted individuals “accidentally” leaking does not exonerate a person from being guilty of leaking. Finally, the timing of this news is additionally significant because next week former CIA officer Jeffrey Sterling’s trial is scheduled to begin. He is charged with ten felonies, including seven under the Espionage Act. All the charges relate to allegations that he leaked information to New York Times reporter James Risen revealing Operation Merlin. Sterling is known to have met with two Senate intelligence committee staffers in March 2003 to report on this bungled CIA operation, which involved a former Russian scientist passing flawed nuclear weapons blueprints to Iran. Sterling went through “proper channels,” however, prosecutors have indicated that they believe he was “unfairly critical” when speaking with committee staffers. They also contend when he allegedly leaked information to Risen he did so in a “false and misleading manner, according to Norman Solomon and Marcy Wheeler. As one low-level officer who is known to have criticized the CIA goes on trial, Holder will have everything in front of him that he needs to charge Petraeus with engaging in a similar offense. Only, in Petraeus’ case, his leaks can only be said to have been for self-aggrandizement. Petraeus quite literally engaged in the narcissism, which critics have condemned people like NSA whistleblower Edward Snowden for engaging in without any proof. He is believed to have gone around the prepublication review process at the agency and leaked classified information to help his mistress write a book called All In: The Education of General David Petraeus. If that kind of vainglorious conduct does not demand prosecution, then the extent to which Holder is beholden to politics of the powerful will become even more clear. Like 9-11, the Paris massacre is not about "Us"